Anyone want to see a bottom drawer case? Well, here is one that was a huge learning experience for me. 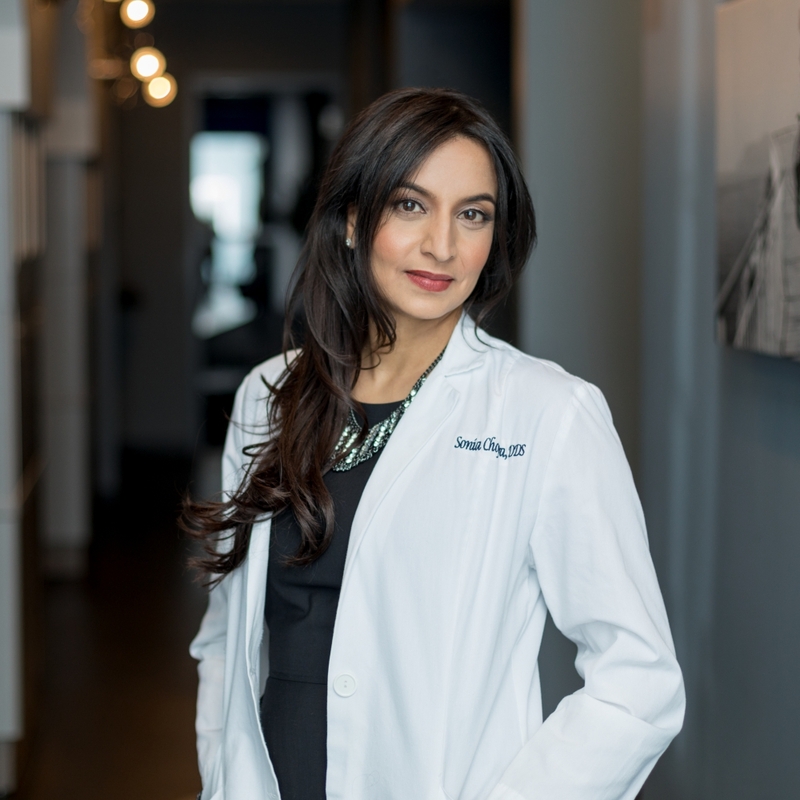 Last year I welcomed a new patient to my practice. 5 years prior her dentist in another state said that she may need a root canal on tooth #3 because of how deep her filling was since it was so close to the nerve. She was fine for many years, but then her pain started 6 weeks prior to her evaluation with me. And yes, tooth #3 was one of the teeth in question. The patient had a very severe response to cold that lingered and a positive reaction to the percussion test. 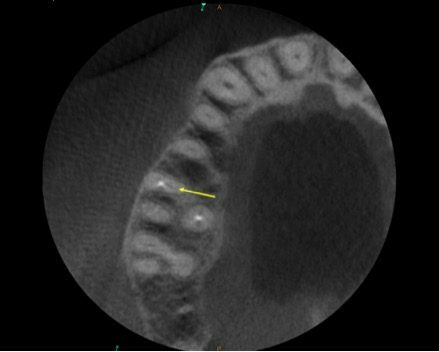 Her diagnosis was Symptomatic Irreversible Pulpitis and Symptomatic Apical Periodontitis #3. 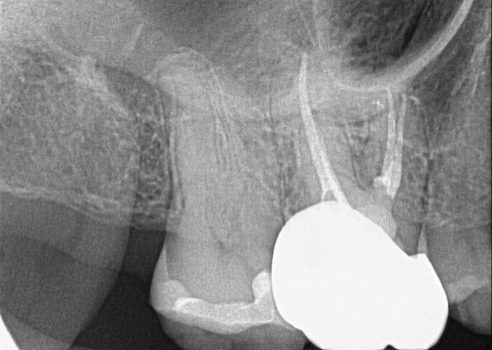 Looking at the radiograph, this root canal looked pretty straightforward. Maybe you can argue that there was a bit of calcification of the canals, but otherwise, it looked like it would be a slam dunk. I love to do these types of treatments in one visit whenever I can. So, I accessed and started to locate and clean and shape the canals. I always start with the main canals, the MB, DB and the P canals and save the MB2 for later. However I looked and looked and looked for that MB2 with the microscope and just couldn’t find it. I have a rule: the MB2 is there 100% of the time. The literature says about 95%, but to me, that means 100%. I absolutely hate it when I don’t find the MB2. 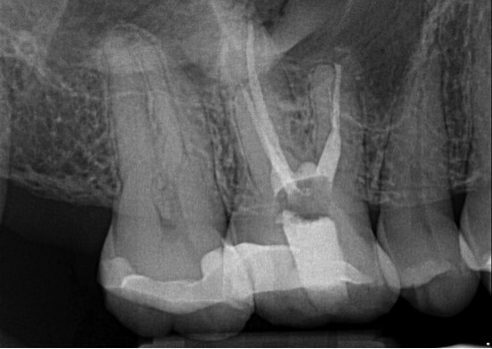 Now, sometimes, you have to draw the line between searching for the MB2 and running the risk of a perforation into the furcation. I troughed a good bit, and I was concerned I was getting close to the furcation. Luckily, my cone beam can help me see what I need to see and allows me to stay conservative. I actually obturated this case thinking that there was no 4th canal. But, the anatomy even on the PA didn’t sit well with me. I knew there was something that I missed in this tooth. So now I have a new rule! 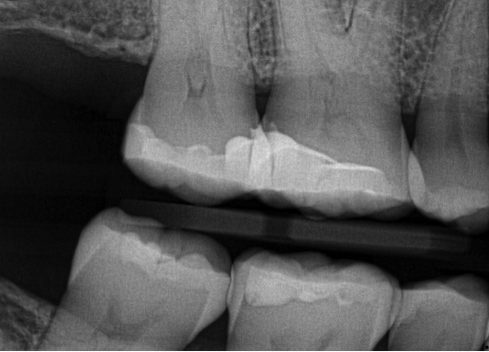 On any maxillary molar, if I don’t find an MB2 canal, I take a cone beam to verify that there was nothing there. So that’s what I did. The axial view shows me that there is room for another canal. The coronal view shows me the same. You can see a few things in the coronal view — you can see the second canal, you can see the area that I was troughing, and you can see the sinus membrane thickened in this scan. 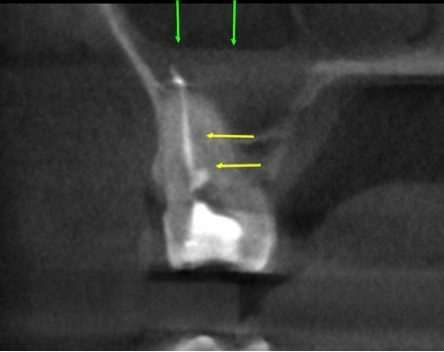 I initially thought that it was possible that the patient wouldn’t have any pain because it appeared from the CBCT image that the MB2 canal was going to join the MB canal. 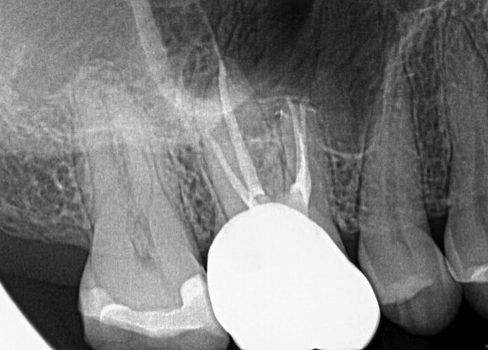 However, I ended up going back into this tooth in order to finish the job because she was actually having pain to heat. Nothing else — it didn’t hurt to percussion — just pain to heat. That tells me that there is another canal. But, I was expecting it to be a confluent canal. I was wrong! The MB2 was separate and that is what surprised me the most. Not that it was there, but that it was its own stinkin’ canal! The CBCT had misled me. So, now I have a second new rule: always instrument each canal as if they are their own separate entity. So, I went back into the tooth and tried again. I searched and searched, and even knowing that there was another canal there, I still couldn’t find it looking through my microscope. Ugh, the struggle!! Even 10 years later, I can still have trouble finding this stinkin’ canal. I continued to trough apically and there was no canal, but there was a groove. So, I took my rotary and started to instrument the groove, pushing ever so slightly into that groove. Finally, I started to get into something and finally popped into the canal. The MB2 is always there, so don’t give up!! Take a CBCT and look at the anatomy of the canals to see if that helps. Don’t assume a canal will join another canal just because that is what it looks like on the CBCT. Always instrument canals as if they are their own separate canal. Sometimes a canal doesn’t look like a canal. It’s not a dot, but rather it’s a groove and you need to find your way into the groove to get to the canal. Just when you think you get good, you can always learn a new lesson. I loved your explanations ma’am.U did it so well. So glad Shikha. Thank you!